Create a warm welcome in your entryway or add a few more along the dinner table with the Amish Royal Mission Arm Bench. 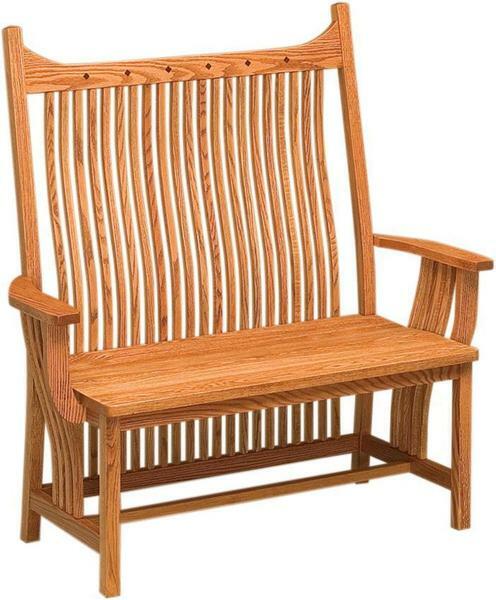 This beautiful wooden bench is full of flowing slats that comprise the bench back and accentuate the sides. Each wooden slat is slender and curving, creating mission style furniture that you'll love looking at as well as using. The crown of the Royal Mission Arm Bench features diamond shaped inlays along the top. This mission style furniture is elegant enough for your dressed up occasions and casual enough for daily dining. This mission style bench is shown in oak wood with medium stain. Oak furniture always delights with its defined grain pattern revealing the organic nature of the tree. This mission style is available in a dining chair and bar stool as well. Classic mission style means no fussy decoration or indulgences. Mission furniture is simple and functional, handcrafted to perform as it blends well with both traditional and contemporary decor. You can accommodate additional guests at the dinner table with bench seating, or add something special in your foyer or hallway. Browse more of our mission style furniture for other areas of your home. The Royal Mission Arm Bench makes a great choice for your business entrance or lobby. Visit our Contract Sales Page for more information about our custom furniture for your business. Shop from the comfort of your home and create the furniture you're looking for with custom options at your fingertips. Our toll-free number is 866-272-6773 for assistance with any questions.